FILE - Martial arts performers are seen during the opening ceremony of the Third Asian Indoor Games at My Dinh National Stadium in Hanoi, Vietnam, Oct. 30, 2009. Child beggars have long been part of the social fabric in Ashgabat, where some families acknowledge that they depend on such income for survival. However, Ashgabat police have begun clearing the streets of those children as the Turkmen capital gears up for the Asian Indoor And Martial Arts Games (AIMAG) in September, according to residents and parents interviewed by RFE/RL. Police officers, raiding the city in vans, order such children home and warn them not to return to the streets, said Ashgabat resident Amanmyrat Bugaev. An Ashgabat police officer within the juvenile-affairs department, who requested anonymity because he was not authorized to speak publicly, described the process as rounding up repeat offenders, taking them home in police vans, and warning the parents that forcing children to beg is a criminal offense. The officer said that in some cases the department summons the parents and issues official warnings. He acknowledged that the "main" goal was to preserve the country's "image," although he said the measures were also aimed at safeguarding children. "A disabled person in a wheelchair begging for money damages the image of any country," the officer said. "The main goal is to fight something that might damage the [national] reputation." Some parents who acknowledge benefiting from alms collected by their children complained that the government's effort deprives their families of their only source of income. Turkmenistan is a mostly rural, post-Soviet country whose jobs and economy are heavily dependent on the state. The wealth from its sizable natural-gas and other exports, including cotton, has largely failed to trickle down to its 5 million or so people. RFE/RL's Turkmen Service spoke with four parents -- all Ashgabat residents -- who said the money their children made on the streets helped the family survive. "Apart from my disabled son, there are three other small children in our family," said one unemployed woman whose disabled child spends hours in the streets every day seeking handouts from strangers. She said the family also "depends on the monthly social allowance he gets from the government." "We would work, but there are no jobs, so we send our children to the streets, hoping for kind people's donations," said the woman, who didn't want to give her name. None of the parents would say how much their children made in a day on Ashgabat's streets. Unemployment is widespread in Turkmenistan, although the government doesn't release official figures. Regional media have put the jobless rate in the country at around 50 to 60 percent. 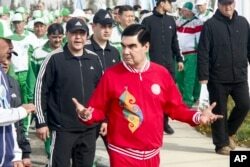 Turkmenistan wants to use the Asian Indoor and Martial Arts Games, the brainchild of President Gurbanguly Berdymukhammedov, to boost its image as a regional sports hub. The isolated nation expects tens of thousands of foreigners to visit during the September 17-27 event. In the months leading up to the games, authorities have restricted the movement of provinces' residents to the capital, ordered former inmates to stay away from the games' venues, and tried to clear the city of stray dogs and cats. Farangis Najibullah wrote this article, based on a report by RFE/RL's Turkmen service.